Is Atonement Healing Back In? I haven’t been able to verify this on the PTR yet, but Atonement healing might be a go when 4.1 lands. For the past few months, I’ve observed that Atonement was simply too gimmicky. The relationship between that ability and Smite just kept going up and down, left and right, hot and cold, and all over the place. At the moment, it’s really awesome on Heroic Halfus due to mechanics of the fight. So how exactly does Atonement healing get better? Holy Fire damage is about 30% stronger than Smite. Atonement triggers with Holy Fire. I believe the initial Holy Fire hit and the subsequent DoT damage get the same increase. I think the DoTs from Holy Fire may even work with Atonement (But I’ll need to check). 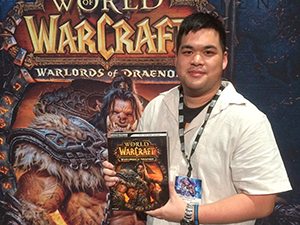 If Atonement healing is back in, you may want to brush up a bit on that style of play. Personally, I still believe its an awkward style of play. If only because the healer doesn’t get to dictate where exactly the heal from the damage ends up. I’ve had problems where Atonement heals would land on a blood worm or something. Smite replaces your Heal. Holy Fire would function similar to a Flash Heal with a DoT. This would be a fun way to heal heroic dungeons in and such, but I’m a little afraid of allowing it in my raids simply because I don’t know enough about the strength and viability of it. The Holy Fire changes alone do warrant a closer look. On a side note, this is great for soloing! Atonement’s one of those really curious talents in the discipline tree. We’ve never really experienced anything like it before and I can understand the reluctance behind taking it. But it’s got some potential. And I found it fun the few times I pulled it off. The basic premise is that you’re unloading Smites on a hostile target. As you’re hitting them with Smite, Atonement activates and heals any player within 8 yards of the target for 100% of the damage that Smite does. Atonement: You absolutely need this. Its kind of the central focus. In an earlier build, Smite would heal 60/120% according to the damage dealt. In the current beta build, it dropped down to 40/80%. As of the current PTR for the 4.0.1 patch, it was raised to 50/100%. Archangel & Evangelism: Both of these talents help with buffing the damage you’re dishing out or allowing you to get some precious mana back. Divine Aegis: Yup, DA bubbles will appear off of heals from Atonement. Feel free to pick and choose the rest of them according to your own play style. You’ll want to get some of these glyphs to help vault your utility. Glyph of Divine Accuracy: I know I have close to zero hit gear. For this spec to work, you need to be able to hit the boss. If you can’t hit the boss, you can’t heal. 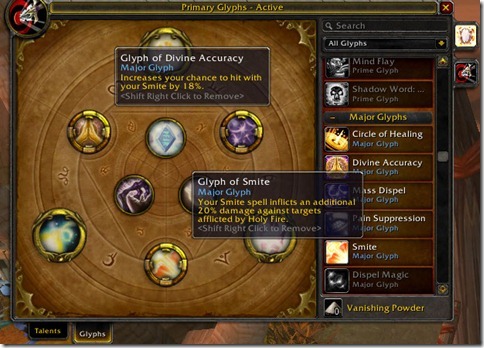 Glyph of Smite: The Holy Fire DoT doesn’t last that long, but the does help. You’re in the discipline tree anyway. May as well get some glyphs that augment that tree further. Open up with a Holy Fire right away, then begin blasting away with a Smite. If you’re lucky, you’ll get in about 4 powered up Smites before th e DoT wears off. You’ll need to eyeball your mana here. Get a full stack of Evangelism going. Between Evangelism and the Glyph of Smite, it should elevate you to some reasonably comfortable numbers. Once I notice a mana deficit of about 15 – 20%, I’ll pop Archangel and instantly get my mana back and resume Smiting. You still have access to your healing priest spells. Don’t be tunnel visioned into believing that Smiting is the only way to heal because it isn’t. It is the main focus, but don’t forget about your other heals. Use them in a pinch if you need to. Instead of sitting back and waiting for people to take damage, you’re actively doing something which has a positive side effect. If you’re in a smaller group environment like a 10-man or a 5-man, you’ll need to keep a closer watch on yourself and any other ranged players that aren’t standing with the melee. In a raid environment, you can use this to your advantage. If you’re like me and contemplating the usage of a full time Smite priest, that’s one dedicated healer on the melee. That means you can focus the efforts of the other healers on the ranged players and maybe an additional one managing the tanks. I expect there to be some sort of diminishing return. I just don’t have the faintest clue what it would be (as in how many players before the effectiveness reduces). Unless you really want to stack your entire raid on top of the boss, the usability of this spec is going to be limited to melee friendly bosses. You don’t want to tango with Deathwhisper or Saurfang for instance. Either the ghosts or bloodbeasts will tear you and your raid up alive. You’d probably want to revert back to the traditional style of being a disc priest and resort to actual healing if those types of bosses are waiting for you. No word yet on whether this will be final in either the PTR or the beta. We’ll know within the next week or so. What I need to now do is find a volunteer priest willing to go Smite heal in our raids. Anyone else planning on giving this a try when the patch kicks in?